A Gatherings favorite, this Springtime bouquet is made with deliciously fragrant lily of the valley, peonies and stock, creamy roses and accents of silvery leaves. Another Gatherings fave, this lush, textured bouquet has been known to make brides cry. It marries fun Spring wildflowers with upscale touches, such as the lush peony and gold accented succulents and scabiosa. 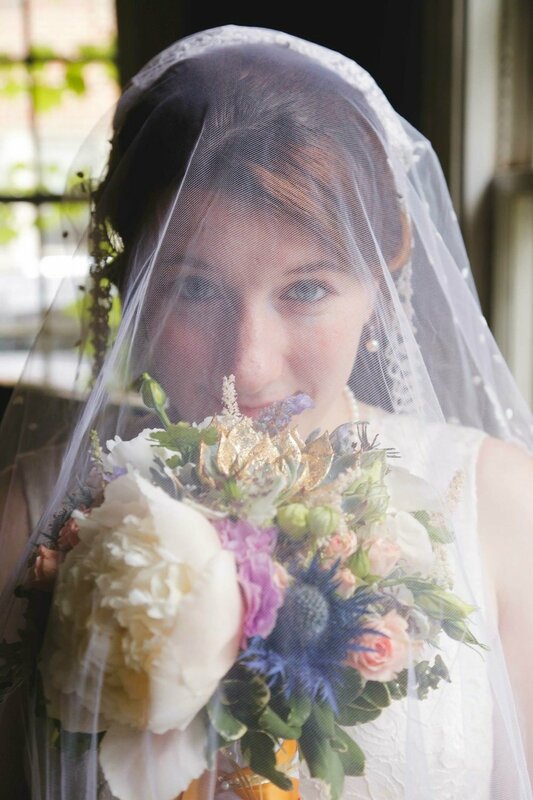 This bouquet was made for a bride with classic tastes who wanted a nod to the season in which she married - Winter. Clean lines with white florals and a touch of blush, accented with blue greenery made this bouquet an instant classic. 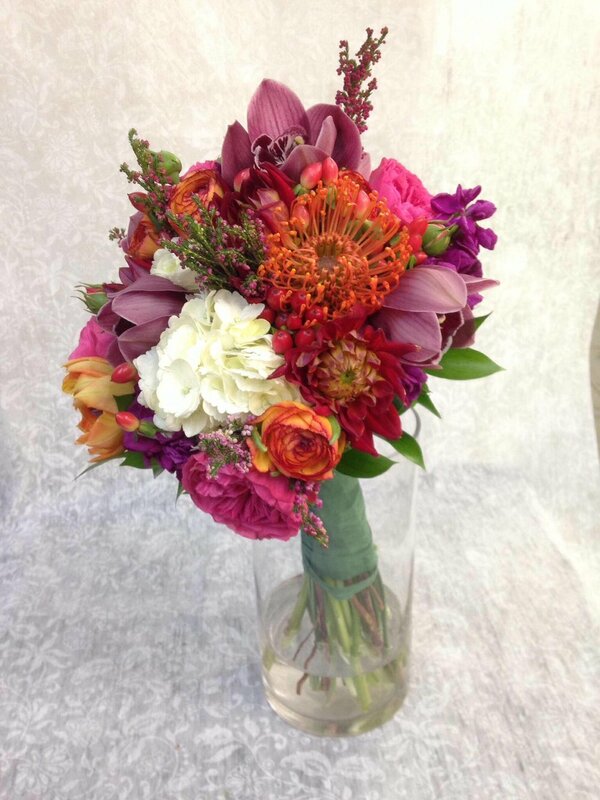 A late summer wedding bouquet made with hot latin colors in shades of fuchsia, bright pinks and shades of orange, this bouquet is for any bold takers that want to make a statement! This bouquet is made with many varieties of fragrant flowers, creating a lush, oh-so-softly petalled bouquet of delicate pastels. A sweet pleasure to create, imbibe and hold. A beautiful bouquet made to complement an amazing bride! She had seen it all - rose bouquets, calla bouquets, so we went farther back and made her an elegant trailing bouquet with orchids, roses and other florals that augmented her fantastically fun and lavish wedding! Intense colors are a favored palette at Gatherings, as can be seen throughout our galleries. This daring wedding bouquet is thus so fun to make! Rich reds and deep shades of purple are tied together with some pinks for a jewel-toned bouquet that is absolutely luscious. A bride with a bouquet as lovely as she! Magical, romantic, with touches of gold, her wedding flowers were fun and chic simultaneously! A bouquet of effervescent Springtime texture and variety, this gathering of flowers holds such a mix of greenery and flowers that no one flower steals the show. Nothing communicates Autumn like foliage, accented here with rich, romantic, deep reds and accents of ivory. See our editorial page for more of this bouquet in action. 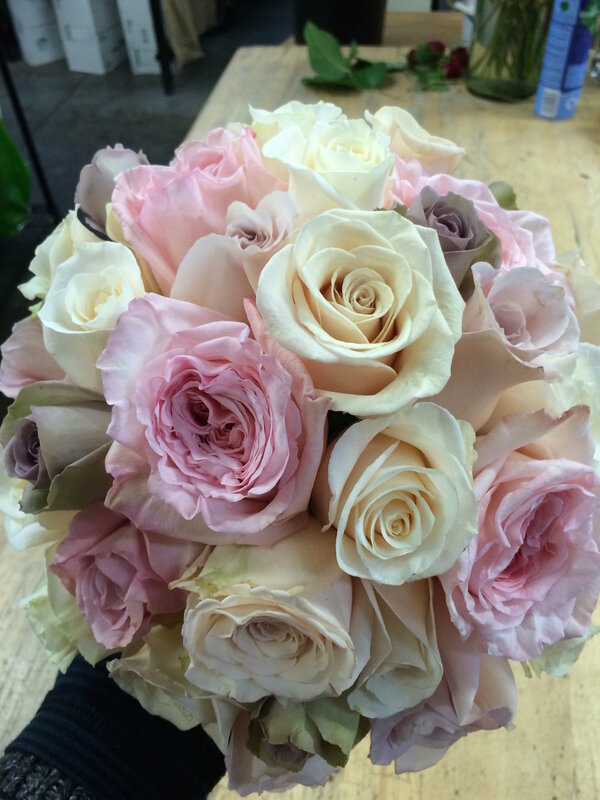 A classic, all-rose bouquet made with a vintage twist - all of the roses are in antique variety shades. This bouquet was distinctive for its look and fragrance! A classic wedding with style, this bouquet was all cream roses and accents of creamy berries to match the bride's golden lace gown. She made a perfect set with her flower girl and groom, with matching boutonniere. He's from DR, her mother's Chilean. Bringing Latin flavors together in a bouquet that nods to tradition with the inclusion of roses, but which then has flair added with folded red tropical leaves. Add to that the french twist on the handle, and this bouquet is class, color and fun! Here you can see the callas and orchids also included in the bouquets, a mix which gives the flowers clean lines but also a tropical feel. The variations for the bridesmaids were smaller and with fewer varieties but in the same colors, so they were a matched set. An unusual bouquet of green florals, accented with the barest touch of actual flowers with the use of intensely deep, rich color. The perfect option for a rock'n'roll chick who doesn't want too much fuss. Boutonnieres can be snapshots of the bouquet; this one pairs with the bouquet in the previous slide, showing the key elements involved. August brides are dear to our hearts, with wild blooms that withstand the heat while still looking dressed up enough for a momentous day. Here dahlias mixed with chocolate cosmos, ranunculus, roses and eucalyptus keep our hearts forever blooming in Summer. A moody, photographer's-shadowed image of the bridesmaid's bouquet to go with the fairy-tale bride. This bride and groom, married in upstate New York, were all about their reception. Decor was zen-inspired, minimalist yet chic. In such a gorgeous setting, nothing more was needed from the florals! A late summer/early autumn mix of hot colors in shades of deep pinks, reds and oranges, with a pop of the traditional white. What fun! White means weddings, but if you want to make sure the time of year is also conveyed, why not also incorporate some seasonal elements - in this case, pine cones! There are not pine cones small enough for a boutonniere, but this one matches the bouquet with its evergreen and dusty silver accents. Calla lilies are a flower that present such a gorgeous, classic shape and line on their own. They are stunning when gathered together in a bouquet. This is only one sample of an effect that can be achieved with a calla bouquet. 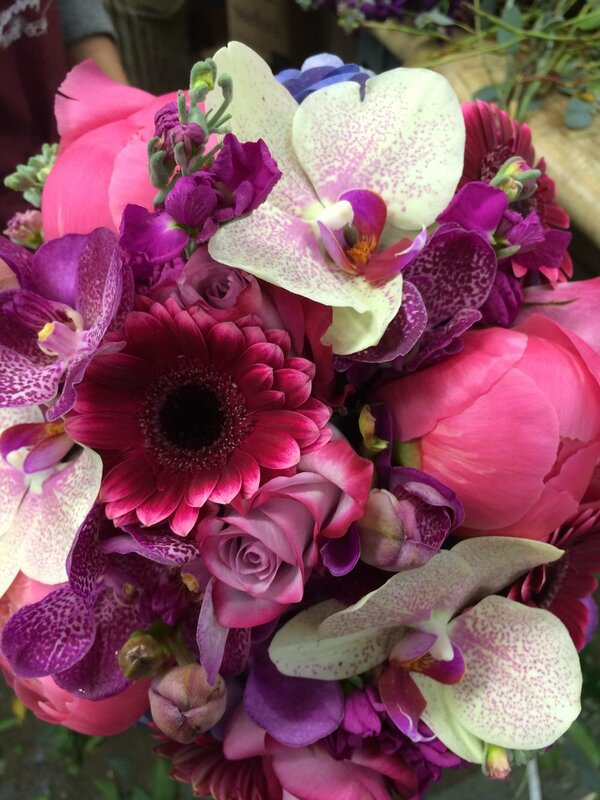 An amazing mix of flowers in shades of pinks and purples, these varieties came together to create a technicolor dream that is vibrant without the assistance of a filter! These sweet ladies came to us for bouquets of their favorites - lilac and peonies - no longer blooming in their country estate. They were married in Tudor City Greens, the idyllic, privately maintained park which is open to the public right across from our studio. 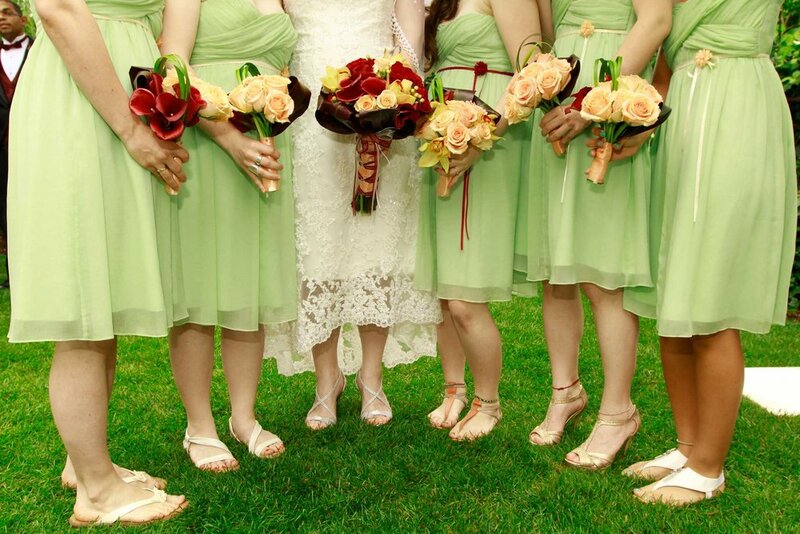 Another way to vary the bridal and bridesmaid's bouquets: play with the color concentration in each bouquet! Congratulations! Get in touch here. Weddings are one of our favorite gatherings! We are happy to design for unions in the five boroughs and in NY, NJ & CT. This page illustrates the variety that can be created for personal flowers, often our starting point for informing the overall design and feel of the florals throughout a wedding. We invite you to peruse the images here for inspiration, and welcome you to contact us via the form at the bottom. and more possible areas of inspiration! With a general idea of your wedding, we can offer an estimate. After these initial steps, it just comes down to ironing out details and anticipating the big day!